The different Ovarian Cancer Stages are basically a measure of how far the cancer has spread. The cancer when diagnosed can be confined to the ovaries or spread to other nearby areas or even distant organs or lymph nodes. Determining the stage the cancer is at when it is diagnosed is important as often the treatment given is decided according to the stage. As you can see, the 5-year survival rate for patients with stage 4 cancer is very poor. 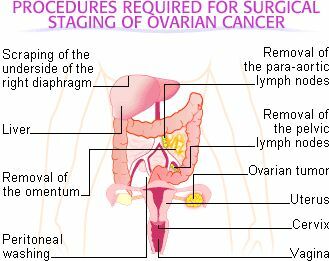 On the other hand, when the cancer is confined to the ovaries (stage 1), the survival rate is more like 80-90%. However, less than 30% of patients are diagnosed in the early stages of the disease (stage 1) (Rosenthal and Jacobs, 1998). This emphasizes the importance of early detection in improving survival rates. The tests and scans patients undergo to diagnose their cancer will help determine the stage the cancer is at. Also, during an initial surgery, tissue is removed from different parts of the pelvis and abdomen and examined carefully in the lab to see whether there are cancer cells in these areas. Peritoneal washings are performed where he abdominal cavity is filled with fluid then removed using suction. This is then examined under the microscope to check for the presence of cancer cells. By understanding the different stages of ovarian cancer patients can become involved in making informed decisions about the treatments available. It is therefore important to find out from your doctor what your stage is. Keep in mind that early detection equates to being diagnosed in the earlier stages of cancer which will greatly increase your chance of survival. 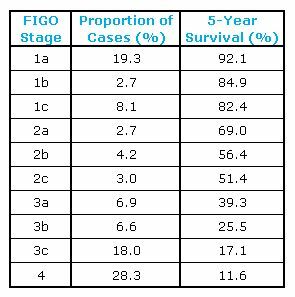 The International Federation of Gynecology and Obstetrics (FIGO) has defined a staging system which is the most commonly used system in the developed world. This system is a very powerful predictor of prognosis in ovarian cancer. The accuracy of staging using this system surpasses any other factors in determining prognosis. There are 4 stages in this system, all with further sub-stages. Within these, there are also different grades. In addition, patioents can be diagnosed with Recurrent Ovarian Cancer, where they have experienced a period of remission following initial treatment but have subsequently developed a cancer recurrence. The biological behavior of the cancers is represented by their grade. It is measured by how abnormal the cancer cells look under the microscope. The tumors are graded on a scale of 0 to 3. Borderline – Grade 0 tumors are non-invasive tumors of low malignant potential (LMP). Well differentiated – Grade 1 tumors look most like normal tissue. Moderately differentiated – Grade 2 tumors look somewhat like normal tissue. Poorly differentiated or undifferentiated – Grade 3 tumors appear very abnormal. Well differentiated cancers tend to grow and spread more slowly, while poorly differentiated cancers grow and spread more rapidly. This means that Grade 1 tumors have the best prognosis, while grade 3 tumors have the worst predicted outcome.